Things are shaping up with the Leah Gent. Thanksgiving was a real feed with all the kids in attendance. We did manage to get a lot done on the boat. 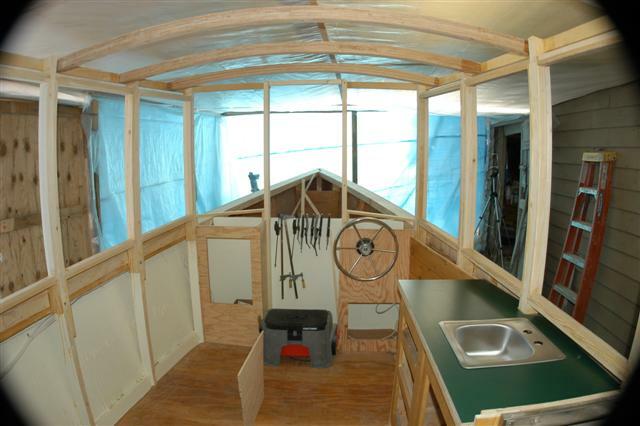 The windows are framed out on the bottom and the rear bulkhead was cut along with the side panels on the back and side of the cabin. All the roof beams are in I think we need to buy more wood!! I will need to wait until warm weather to put on the roof due to the limited space above the boat with the winter plastic in place. We have finally decided where to put the fridge and stove. This is the part of the project that requires larger chunks of money and you really don't have much to look at when you get done. Lots of little jobs to keep us busy until then. We didn't get to work much over the holiday due to a white Christmas and 80+ mile per hour wind. The boat shop took a beating and now everyone including me is sick. We leave for Florida on Sunday to get parts and tanks and other needs. At least it will be warm down there. Happy New Year. Debbie and I celabrated our 27th anniversary on New Years day with a cruise thru the lakes of Winter Park, Florida. It was nice to be warm for a change. We picked up a lot of the parts and pieces we needed at some salvage places in Florida. I don't think my Honda Civic could have held another box. I managed to find a 50 gallon gas tank that will fit under the back deck perfectly and leave me room for the holding tank. We got a lot of strange looks with it strapped to the top of the Honda. 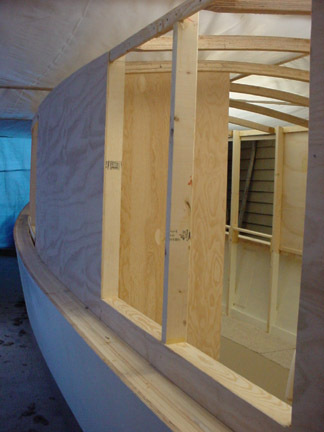 If you are thinking about building a boat, check the links page for the address to the Flounder Pounder, aka. Ken Gearin. He has a lot of stuff you will need at about half of the prices in the catalogs. We saved a ton of money with him and he can get it for you if he doesn't have it in stock. Picked up a stainless propane range and built the bulkhead yesterday for it's location eventually. We will have enough work to do with all we bought in Florida to last us a month or two. I'll put up a picture soon. 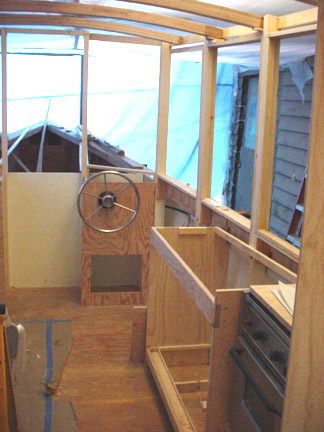 We spent the weekend getting the helm station, stove, galley and water tank roughed in. 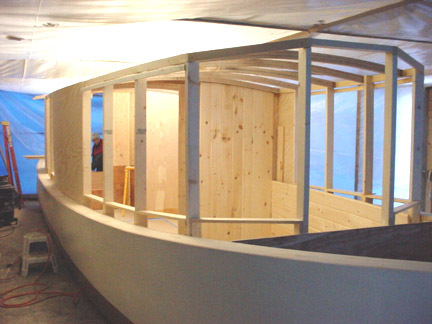 The toughest thing about building in a boat are the angles. The sides come in as you move forward and the floor comes up. All this makes cabinet building tough. We tend to mock up things before we start cutting wood. 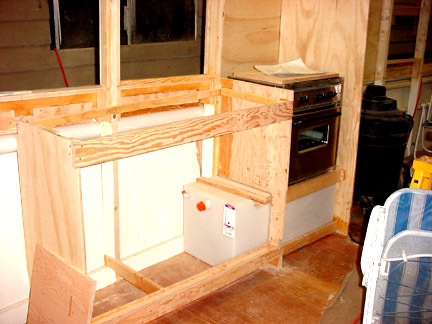 I built the bulkheads for the stove to sit between and framed out the galley. We put the water tank under the stove to save space under the galley. The helm went in without a hitch. Although I have had a lot of boats I have never replaced the steering cable on any of them. We used a Tel-Flex system and it took all of 15 minutes to put it in. I was dreading this part of the building process but it turned out to be very simple. There is something special about putting on the steering wheel for the first time. I put PVC tubing under the gunnels to run my cables and wiring through and it is a lot easier than routing things behind panels.The panels for the cabinet fronts are in the clamps now and I hope to get them stained and on next weekend. Also, everyone keeps asking about the door leading to the bow. It will be cut out as soon as I get the height of the front deck. We are concentrating on the interior because it has been too cold to do much epoxy work and the bow will require a lot of epoxy. I may put a dagger board trunk in front of the forward buldkhead to help with docking, yet keep any leaks outside of the main cabin. More on that later. Thanks to all who send me the encourging e-mails. I get a lot of good ideas from the people who read this page. Thanks!! Finally had 3 whole days to work on the boat. It snowed 6" Thursday night and that pretty well shuts down the town. 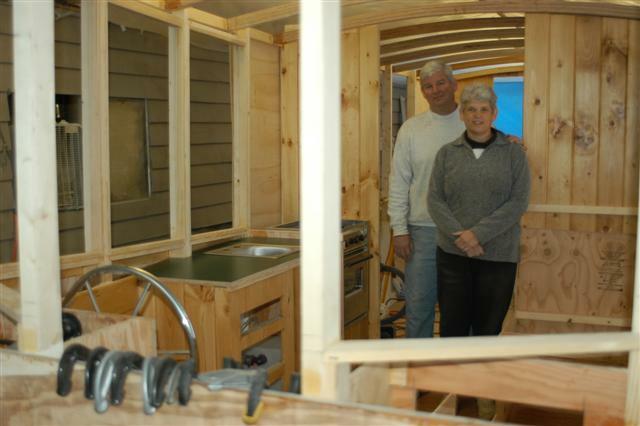 We got a lot of the wood in the front part of the boat stained and fitted and the front on the galley along with the counter top and sink cutout. 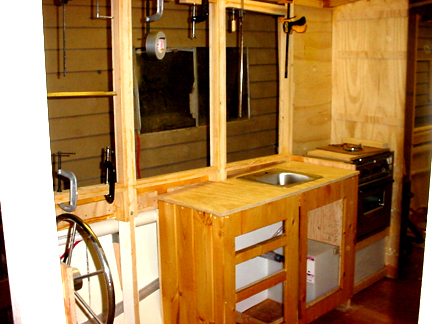 Plumbed out the lines from the water tank under the stove to the water heater and finished up the window frames for the front windows. You can see the clamps in the picture for the last one. It's on to building the booth this week. Another snow Wenesday so maybe more time to sneek away from the office. Got in a good weekends work. 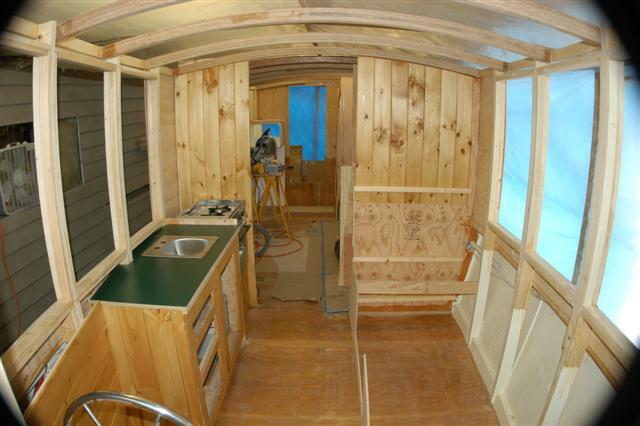 The counter top laminate is on and we put up most of the wood in the forward cabin. 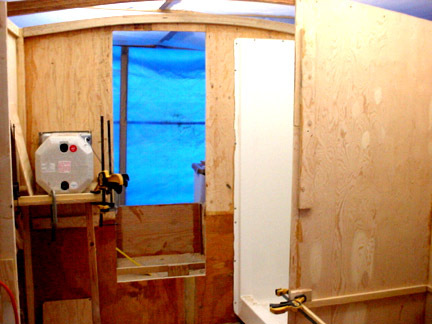 We have decided to start at the front of the cabin and work our way to the back of the boat to keep from scratching up the wood work as we go. The picture to the right shows the new hunter green counter top and some of the wood paneling. You can see the start of the booth. We got the face template cut out and made a few changes as to where things will be. We put more paneling up on the right after Doug took these pictures. One of the problems with trying to take pictures of the interior of the cabin is I can't get back far enough to everything in. Doug brought over his fisheye lens and I finally have a picture with most everything in it. That's Debbie and I in one of our few pictures together. I'm usually behind the camera. These are the rear windows lacking the top frame. The helm station is roughed in.